"Ch. 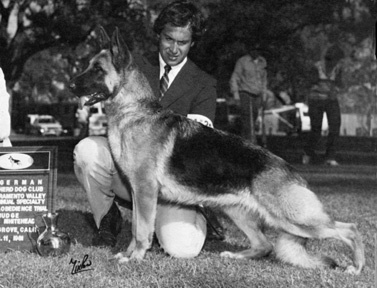 Scherzar's Nefertiti is line bred on GV Ch. Lance of Fran-Jo ROM and GV Ch. Yoncalla's Mike ROM. She has 3 champion sons and 3 other point winning progeny. Two of her Champion sons and 3 of the other ROM point winning progeny are sired by Select Ch. Woodacre's Dakota ROM and are line bred Harrigan, Halo and Reno. Her other Champion son, Logan is sired by Select Ch. Checkmates Way To Go and is distant line breeding on Lance & Bernd."